The Saturn Peach has a long and storied history. Cultivated originally in China in 1897, they hung around in America for sometime before everyone in the 90’s suddenly decided that gimmicky food was the greatest thing anyone had ever thought of. I remember seeing them myself off and on for the last twentish years, but not until this week did I pick one up. 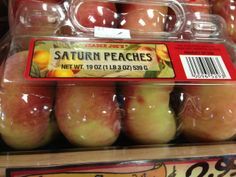 Hopes rode high, but the long and short of it is that Saturn peaches are still just peaches. Unless you’re craving the feeling of holding a donut but eating something different, feel free to pass these up for any other produce on the floor. Peach merchants have tired to make much ado about the supposedly sweeter nature and firmer flesh of the saturn peach. I can’t disabuse this, but I am pretty sure I’ve had the occasional sweeter and/or firmer normal shaped peach in my life. In the end, what’ve got on our hands, is a gimmick. Then again, maybe I’m being too hasty. After all, there are probably many important functions a flattened peach could perform. If you’re a driver on the go, you could set the peach on your dashboard with the assurance that it won’t go maverick on a sharp turn and roll into the footwell. There’s a similar benefit for your standard 50’s era construction worker, meticulously unpacking his lunch pail as he sits on a gusty girder high above street level. Or maybe you could stack them neatly in your fruit bowl and regard them silently, arms crossed, stroking your OCD. Imagination fails me beyond that. In the end, the Saturn peach is ultimately little more than an elegant stand in for one of modern life’s most common faults– a great deal of thought spent on making an eye-catching object and a beautiful package, and none spared for the content. Would I recommend them: No. Would I buy them again: No. Final Synopsis: You can pass up these weird-shaped peaches. to produce a very good article… but what can I say… I hesitate a whole lot and don’t seem to get nearly anything done.